Great theme, all those photos are so beautiful! I can’t get enough of denim! And I just love seeing this collage of denim … it’s a great way to get some good ideas. I really love the top centre, with the overcoat. Thank you for your beautiful pictures, Scott! 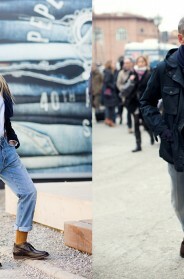 Absolutely love this fad, layering denim can be very interesting when done the right way! I like the denim outfits!!! The second photo/look is amazing! Yes, I’m still talking about denim on denim!!! Love it! So this is what I’m learning from the blog. Basically, I can wear whatever the hell I want, as long as I wear it with really high heels. Are you kidding? It never gets old! The “Canadian Tuxedo” is a classic!!! As a Canadian, I have to admit that I love the reference of denim on denim as the Canadian Tuxedo. It makes me giggle every time. Clearly, if accessorized properly, it is a very rad outfit. The timeless lovely youthful denim – love it! Nothing to think about. Just do it! I love the pics of the first row! Beautiful collage; I love women in third pic. Okay, admittedly, not all of these work (although the photos are fabulous!). The 1st, 2nd and 3rd photos on the top show probably the best use of denim on denim I’ve ever seen (in fact I think I may totally get a denim shirt to wear with my skinny jeans and heels and if anyone gives me crap about it I’ll tell them to check out your site!). Thanks for the inspiration and the reminder that sometimes, this look actually works. 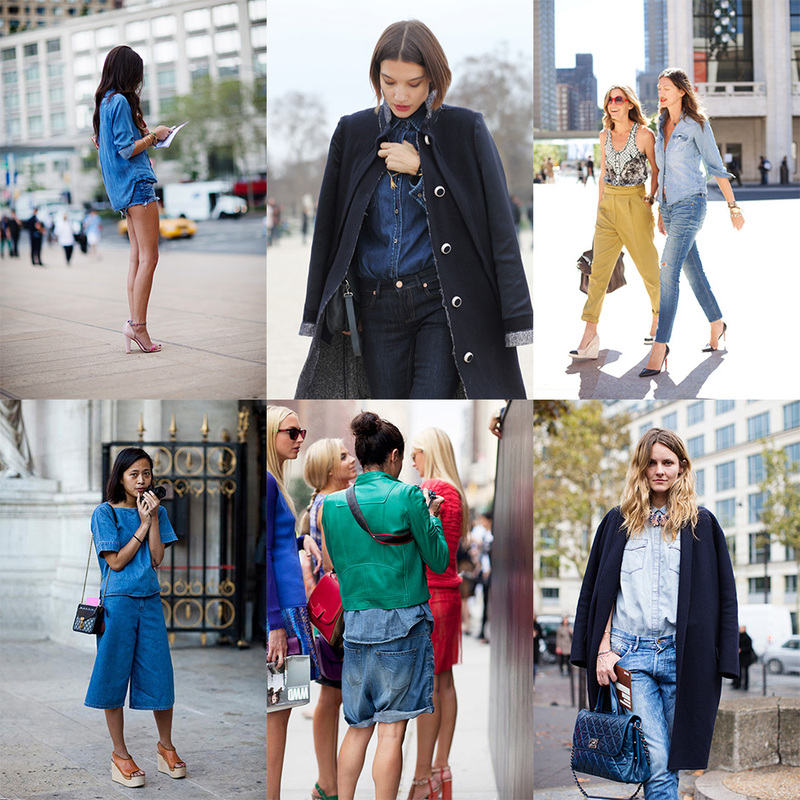 Love denim on denim and love the shorts of Garance…. or is it a dungaree with shirt worn on top? I love double denim, I wear it very well! That second picture is my favorite. This ensemble could be worn at any age and the coat is perfect. I really like denim style. Nice. I cannot just pick something I like best… Because I like all of it so much! I do it all the time. I think it’s a great style. Aweome Post. Shoutouts to Jenna Lyons from J.Crew in the third photo. Beautiful pics. Women in first and third photos are my favorite. That could possibly be the most beautiful jacket in the whole wide world. do you have any more guys? these are wonderful, but i’m having a hard time seeing myself in short shorts for the winter. I’ve noticed that denim goes terrifically well with 4 inch heels. It really swings. Is that a denim coat? Le Denim de Nîmes mérite bien que l’ on s’ y attarde. I love this idea and these posts! It is so great for inspiration. THANK YOU! I live for great demin. I was still thinking about it and wondering where the denim on denim queen was, Jenna Lyons….here she is, thank you! Garance, teenager jeans, its NO, NO, NO!!!! look at that awesome clothing. this is so beautiful and cool. Ist photo.. Vivianna V. surely ! if you want to see denim on denim , come to Sweden. The swedes know how to pull it off so well. These pics make me feel a little *smug* – I must be on board with the zeitgest – I bought a second hand denim shirt a few weeks back – my preferance it to wear it over a white tank top and black jeans and boots.